I swear I perform more of a disappearing act these days then is acceptable. I don't know where the time goes but I hate how little of it is spent here! I usually take Yoga Tuesday nights but this week I wasn't really feeling it so I cleaned instead. Something to remember for next time... yoga > cleaning. 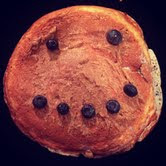 I came up with a delicious protein pancake recipe Monday night, blueberry with maple almond butter. I'll admit I am feeling a little guilty about blowing my "plan" already but I can get back on track and readjust for next week. It may not be ideal for me to have shakes as dinner but I can have them for breakfast or lunch then stick to lean proteins/greens at night. I'll report back on how it comes out. Also, I miss my Friday Favorites posts....I really want to try and bring them back in the next few weeks, hold tight for that. For now lets just get me back to blogging 5x a week instead of going missing, okay? Great Post! I think we all need to be reminded that we are human after all, and we can't be perfect 24/7. Thank you for being so honest. Your workouts this week as well as the rest of your eats sound great, and lets be real, who can resist homemade garlic bread?! ;) have a great day! Yay for kickboxing! That's tough stuff; atta girl! And that other stuff happens... It does! To everyone! You just regroup. No worries. Keep rockin'! You are A-DOR-A-BLE! Glad to see a post from you!!! I love the gym unicorn thing hahah....you are still doing great on plan and i made your mexi sweet tater and it was SO good!! !